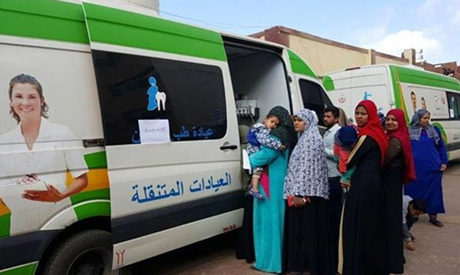 Egypt's Minister of Health Hala Zayed has announced that nearly 19 million citizens have been screened for Hepatitis C and other non-communicable diseases as part of the '100 Million Lives' campaign, the largest-ever nationwide campaign to eradicate hepatitis C launched last October. Zayed affirmed that a total of 6.5 million citizens have been screened for the virus since the launch of the campaign's second phase by the end of November. The initiative aims to examine between 45 and 52 million citizens out of a population of 104 million. The first phase of the three-phase campaign lasted until 30 November and included the governorates of Damietta, South Sinai, Matrouh, Port Said, Alexandria, Beheira, Qalioubiya, Fayoum and Assiut. The second phase included Cairo, Beni Suef, Sohag, Menoufiya and Kafr El-Sheikh governorates. According to 2015 statistics, 22 percent of the population carried hepatitis C.
Over the past three years, Egypt has been successful in the intensive use of a variety of new medications to combat the virus. In 2016, the health ministry achieved a 96 percent cure rate of the disease nationwide. The health ministry has vowed to completely eliminate the disease in Egypt by 2021.